Thursday, September 20, 2012 at 3:38 pm. Hope you didn’t like the Manhattan Bridge. That cliché about how you don’t miss a good thing until it’s gone? That’s how a lot of iPhone users are feeling today about the old Google-powered Maps app. As you may have experienced by now, Apple has replaced it in iOS 6 with a new app that’s better in few ways and worse in a lot of ways. 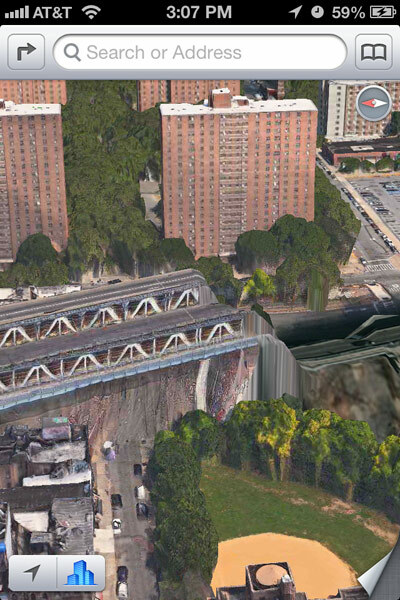 No sugar-coating here: The new iOS 6 Maps app really is worse than the old one. And it’s a bummer. But that’s reality! And now, an important way Apple can prove it’s the best mobile company in the world is by making its Maps experience the best, too. Maps are important! They’re one of the best examples of how life with a smartphone is way better than life without one. Exploring my own city and foreign cities is exponentially easier and faster, and I feel more confident and safer getting around. The Maps app that Apple made with Google’s map tiles and search services was the best in the world, and now it’s gone. C’est la vie. I don’t know why Apple and Google split up. It could have been Google’s decision or Apple’s, or both. Perhaps Google wanted to stick a lot more ads in the maps, or wanted user data that Apple didn’t want to provide, or wanted an unreasonable license fee. Perhaps Apple didn’t want to rely on its archrival anymore for one of its most important services. Perhaps Tim Cook made too many jokes about Sergey Brin’s glasses. I don’t know. Now that we see just how crucial Google was to Apple’s Maps service, it seems even more important for Apple to make its own. This is a piece of the smartphone story that is too central to farm out. That would be like Google trying to rely on iTunes as its media store. Let’s be realistic: Google and Apple are straight-up competitors now, and they’re not going to be getting much closer in the near term. The fact that Google Maps felt as much a part of the iPhone to me as the homescreen probably isn’t a positive for Apple. It’s better for Apple to own Maps than not own it. I’m sure Apple wishes it had released a better Maps product. Or that it had more time to prepare. I can’t imagine the folks working on it are perfectly pleased with it. This isn’t the sort of situation where you say tomato and I say tomato. This is a pretty clear difference in quality between app number one and app number two. One of them tells me which subway to take to the dentist’s office. The other tells me there’s a restaurant in the school playground next to my apartment that’s actually in a different city. Guess which is which. Anyway, the good news is that it’s now out in the open and Apple can start collecting data on its own, including the bug report I filed about the misplaced restaurant. Maps are hard! I have no doubt that Apple appreciates this now much more than it did before. It makes more sense that Apple’s Maps are bad than it does that Apple’s Podcasts app stinks — maps are harder. But Apple can do this if it wants to! It will require a lot of work, a lot of money, and it will require becoming comfortable doing things that Apple isn’t historically comfortable with, like getting small things wrong all the time, potentially paying people to drive around in funny-looking camera cars, making constant revisions and iterations to a live service, etc. But it’s totally possible. If anything, this will be one of the best indicators of Apple’s future in the post-Steve Jobs era. If Apple can take this sort-of-passable Maps app and make it into a really great one, with functional transit directions, better map tiles, and all that, it can do anything. If it can’t, for whatever reason, that’s something to legitimately worry about. Mobile services are just as important to Apple’s future as perfectly polished iPhone edges. (Also, maps are fun!) This is going to be very exciting to watch.